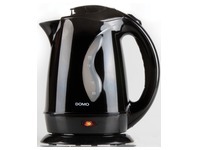 Wouldn't it be great to boil water in seconds and to easily clean the kettle? The flat heating element enables you to boil water fast and it is easy to clean. The washable anti-calc filter gives you clear water, thus clearer drinks.